Stress, Strain, and Structural Dynamics is a comprehensive and definitive reference to statics and dynamics of solids and structures, including mechanics of materials, structural mechanics, elasticity, rigid-body dynamics, vibrations, structural dynamics, and structural controls. 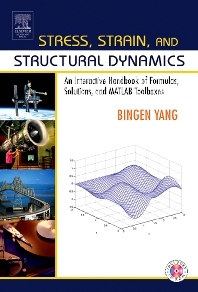 This text integrates the development of fundamental theories, formulas and mathematical models with user-friendly interactive computer programs, written in the powerful and popular MATLAB. This unique merger of technical referencing and interactive computing allows instant solution of a variety of engineering problems, and in-depth exploration of the physics of deformation, stress and motion by analysis, simulation, graphics, and animation. This book is ideal for both professionals and students dealing with aerospace, mechanical, and civil engineering, as well as naval architecture, biomechanics, robotics, and mechtronics. For engineers and specialists, the book is a valuable resource and handy design tool in research and development. For engineering students at both undergraduate and graduate levels, the book serves as a useful study guide and powerful learning aid in many courses. And for instructors, the book offers an easy and efficient approach to curriculum development and teaching innovation. Combines knowledge of solid mechanics--including both statics and dynamics, with relevant mathematical physics and offers a viable solution scheme. Will help the reader better integrate and understand the physical principles of classical mechanics, the applied mathematics of solid mechanics, and computer methods. The Matlab programs will allow professional engineers to develop a wider range of complex engineering analytical problems, using closed-solution methods to test against numerical and other open-ended methods. Allows for solution of higher order problems at earlier engineering level than traditional textbook approaches. Upper undergraduate level and Graduate level and practicing engineers involved with structural mechanics in mechanical, civil, and aerospace applications.